Collars are important for your dog to have, so you can fasten an ID tag, a dog license and leash – but it’s important to ensure your canine pal has the right kind of collar. Flat collars: Flat dog collars are great all-around collars. Pick one that is sturdy and designed for the correct weight of your dog – use wider, thicker collars for larger dogs. Head halters: Head halters have a strap that goes across your dog’s nose. When your dog pulls, in most cases, the straps tighten. This puts gentle pressure along his head, making him stop pulling. The halter also helps steer the dog in the direction you want him to go. Head halters must be fitted correctly and used as directed or you could injure your dog. Trained pet supply store staff can help fit your dog with the correct head halter. Martingale collars (web collar, not a chain one): Martingale collars stay loose around your dog’s neck yet tighten if your dog tries to slip out. When adjusted correctly, if your dog tries to pull out, the collar will tighten around his neck preventing escape, but not choking your dog. Harnesses: Harnesses provide more comfort and security for some dogs – particularly small dogs. They can also be a safe alternative for dogs with eye conditions or breathing issues where pressure from a collar on the neck is a concern. No-pull harnesses: When your dog starts to pull, the straps create pressure across or under your dog’s chest (depending on the style) and he stops pulling. The important point to remember is that these harnesses are not actually training your dog not to pull – they are simply discouraging the behaviour while the dog is wearing one. There is no quick fix to stop a dog from pulling. The solution lies in a good training program based on positive reinforcement and a little help from a humane head halter or harness. 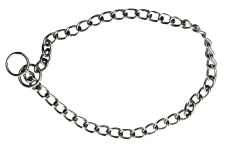 Choke chains: Choke chains are nasty, old-fashioned training devices. When jerked they snap against the throat of your dog, causing pain and discomfort. Even the newer “padded” styles can cause serious injuries to a dog’s neck, voice box and back. 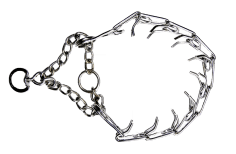 Prong (or pinch) collars: Prong collars have metal spikes that drive into the dog’s skin as she pulls or when you pull on it. The pressure and pain cause your dog to stop pulling. 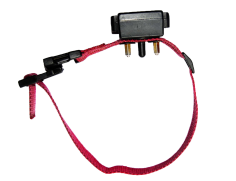 Electronic collars: Electronic collars are typically used for training, and should not be worn by the dog all the time. They offer different forms of correction: electric shocks (sometimes called “static corrections”), noisy beeps, vibrations, ultrasonic sounds, or blasts of air or citronella. Many of these collars are controlled by remote, allowing the trainer to choose a setting (from mild to strong) and then deliver the correction when the dog misbehaves. The problem with collars such as these is that they tend to punish the dog for unwanted behaviour and there is serious potential for abuse. They cause dogs anxiety, fear, distress, pain or injury – and therefore cannot be condoned by the BC SPCA. 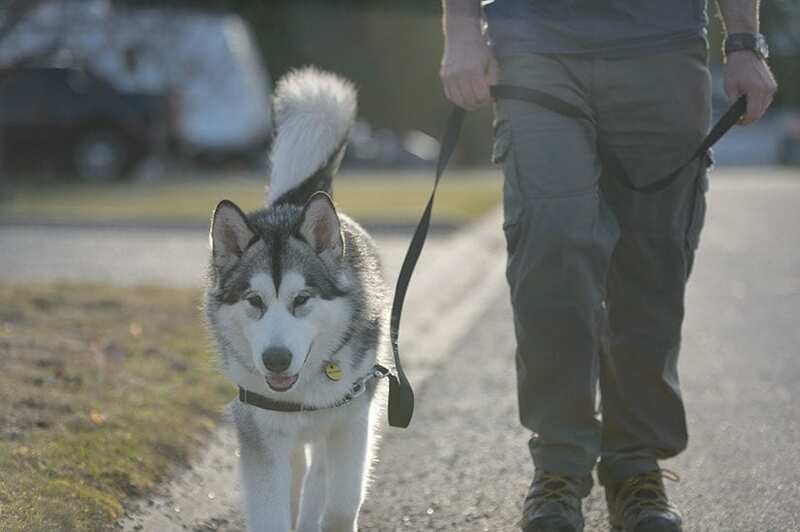 In specific instances, collars that only vibrate or beep can be used to grab the attention of a deaf dog or an off-leash dog who is too far away to hear your voice. Any training collar must be used carefully and under direction of a dog trainer who follows humane, positive reinforcement training methods. Some electronic collars are specifically intended to prevent barking – the natural communication method of dogs. The BC SPCA is opposed to these collars and believes there are other, more humane ways to deter barking. “You should also regularly check the tightness of your dog’s collar, especially as they grow from a puppy to a grown-up. The general rule is that you should be able to easily slide two fingers under your dog’s collar,” Monteith says. Does your dog need a professional dog trainer? Learn how to choose a humane trainer. For humane dog collars and harness options, visit shop.spca.bc.ca.